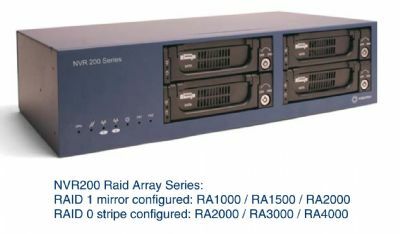 ClearOne Converge PRO 880 The successor to the industry-leading XAP 800. As the flagship product in ClearOne’s next-generation Converge™ Pro professional audio conferencing product line, the 880 is a complete audio system that delivers rich functionality with improved audio performance, enhanced management, and simplified configuration for audio conferencing and sound reinforcement applications. The Gefen DVI to VGA Converter is a small box solution that converts DVI-D to VGA Analog PC/RGB, enabling digital sources to connect with any monitor, projector or TV using VGA. Output resolutions up to 1920x1200 are supported. The Gefen DVI to VGA Converter features EDID management that allows rapid integration of the source and monitor. 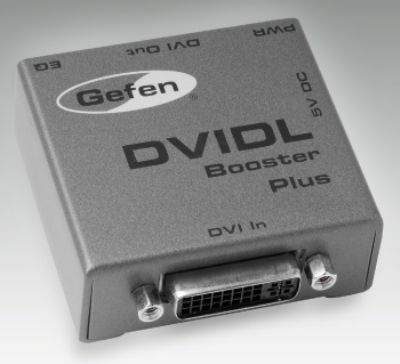 Gefen DVIDL Booster Plus The DVI DL Booster Plus can extend a resolution of 3840 x 2400 up to 200 feet over standard copper dual-link DVI cables. In addition to far exceeding the typical 15 foot limitation imposed by copper cables, the Booster ensures that the video signal is free of distracting artifacts such as sparkles, static and lines. DDC signals are also strengthened to ensure that the communication channel between the display and the DVI source is robust and uninterrupted. The DVI DL Booster Plus is an excellent solution for those looking for a cost-effective way to extend dual-link DVI video. DVI DL Boosters can also be daisy chained to create extensions longer than 200 feet, and can also be used to link two shorter cables together to create a longer extension. and have class-leading MPEG-4 or H.264 compression technology built-in. 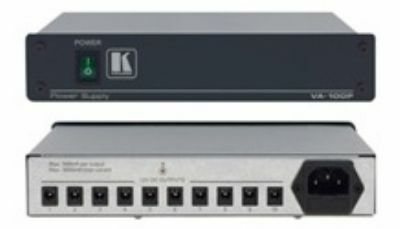 Kramer - VA-100P 10-Port 12 Volt Power Supply The VA−100P is a 10−port 12V DC power supply. It replaces up to ten separate 12−volt adapters for Kramer TOOLS™ and other models that use 12V DC power adapters. Replaces up to 10 Individual 12V DC Power Supplies - For Kramer TOOLS™, Kramer Pico TOOLS™, and Kramer 12V DC Desktop models. Max. Power - 3 amps: 500mA (up to each of 6 outputs) or 300mA (up to each of 10 outputs). 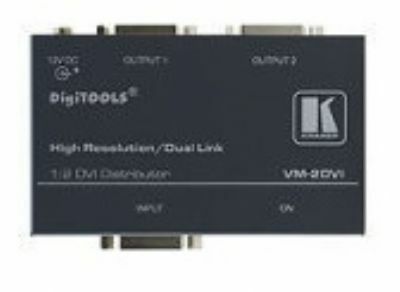 Kramer - VM-2DVI 1:2 DVI Distribution The VM-2DVI is a distribution amplifier for DVI-D video signals. It takes one input and distributes the signal to two identical outputs. The Lassen XL Series offers flexibility and adaptability to any application where saving space and economics are important. 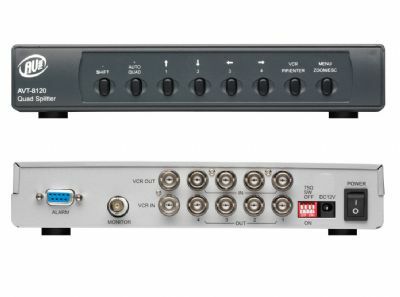 The 1616VS analog video routing switcher is available in a compact 2RU frame and supports breakaway stereo audio (2 levels). Titlemaker-3000 Character generator delivers sharp, high-resolution titles (720x480 pixel). tvONE - 1T-VS-658 HDMI Video Scaler 1T-VS-658 Video Scaler is an Up and Cross Converter with HDMI output. Fully scaleable video inputs include HDMI, DVI (via the HDMI connector), Analog RGB via an HD-15, Analog YPbPr or 480i/576i YUV Component via three RCA, YC and Composite Video. 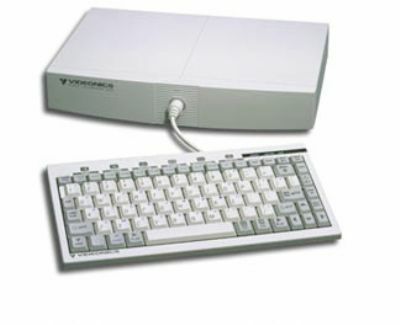 It handles I/O Resolutions up to 1080p and WUXGA. Both digital and analog audio processing is supported and audio delays of up to 150ms can be introduced to insure lip sync. Five Analog Stereo and a SPDIF Coaxial Digital Audio input can be selected for embedding into the HDMI output. A separate Coaxial Digital Audio output is also provided. 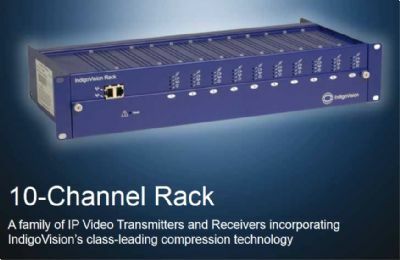 Advanced features, such as 3D Motion Adaptive De-Interlacing, 3D Noise Reduction and 8-bit triple ADC/PLL technology, combine to provide extremely high quality signal conversion. 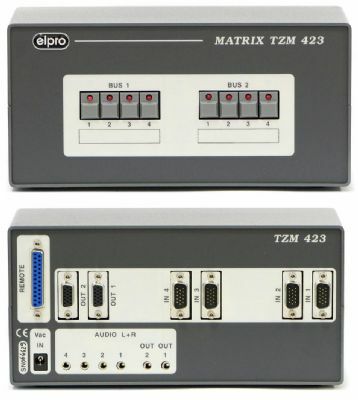 The HDMI I/O is HDCP Compliant. An OSD (On Screen Display) menu makes the 1T-VS-658 easy to set up. Control is via front panel joystick and buttons, Infrared Remote or RS-232 interface. suited for VGA/XGA signals plus combined audio. TZM 423 can manage YUV, RGBS or RGBHsVs signals as well. destinations by 2 different signals.